← Public Service Annoucement on Celebrities: Who Cares?!?! Obviously you. That means … time for a new car! Time for a new bedroom set! Time for a new, oh that’s not what President’s day is all about? So George Washington didn’t want Americans to get a sale on a brand new Chevy?! What have I have been learning?! A quick look at the history of this holiday celebrated every third Monday of February will tell that this day was cemented as a holiday to celebrate George Washington’s birthday. Then later on (so no to anger Lincoln fans), they revised the holiday to celebrate Washington’s and Lincoln’s birthday. This whole time I was under the impression that this day was for honoring all past presidents. Where did I go to school?! However, it makes sense. This country has been served by some fine presidents (JFK, Clinton, Roosevelt), however even they owe it to Washington and Lincoln. 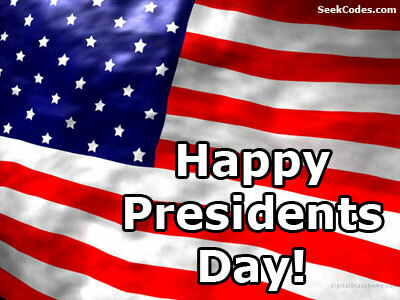 Yet to look for the exact explanation of Presidents’ Day, it took me to a website giving me a great deal on Dell computers, a reminder that Macy’s is having an extra 15% on anything on their store and if you are an online shopper don’t forget the key word: President! It seems that just like Valentines Day, we are looking for anything to get people to spend money. And instead of spending President’s Day as a time to honor and celebrate the births of our nation’s leaders, we are seeing it as a great day for shopping. How else we can honor the day by helping the economy. I went out and bought a king size Serta mattress. I will definitely be sending my thank you cards to Washington and Lincoln in the mail! Nevertheless we ARE forgetting the greats feats that both Presidents took on to accomplish for future generations of Americans. No matter how we view the holiday, we shouldn’t forget that this day is about the greatest two presidents in this country’s history. And while we get this day off from school or work, we should sit back and remember the lives of these presidents and owe them the fact that because of them we are able to go buy a 55 inch LED flat tv. Reflect on Washington being the first president ever to lead us on the path of democracy. Reflect on Lincoln’s view that truly all men are created equal. Then after you remembered them, and even saluted the flag on the representation of what they founded, then you can go wild in your spending purchases. This entry was posted in Blogging, Comedy, Funny, History, Holidays, Humor, News, Opinion, Past, Sarcasm, Uncategorized and tagged Ain't the Hoildays Grand, History, Humor, Pictures make me laugh, Presidents' Day, Sarcasm. Bookmark the permalink. Very witty marina. 🙂 you forget that Presidents Day also means clothes are half off at the thrift store. The homeless can rock stylish hand-me-down threads for even less. Thats the most important part! You are soooo right! I haven’t seen one commercial about President’s Day that didn’t involve a sale somewhere. Everyone is having a President’s Day sale. As a matter a fact, it’s a yearly even for car dealers, furniture stores and electronics stores. 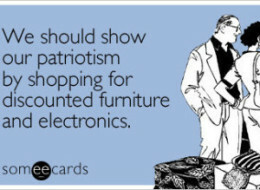 I’ll pledge allegiance to anything that gets me 50% off! All in all, President’s day is about more than just sales and it’s meaning has been lost over the years. here here to 505 discounts and stores practically giving it all away!